Security is one of the major “missing” things from the free ELK Stack compilation, so let’s talk about achieving it! I have never tried X-Pack Security, but considering the fact it is made by the elastic guys, it should be pretty handy of achieving all kind of Elastic related security. By reading the documentation, seems like it provides almost anything you may need about successfully securing your cluster. If you or your company are already paying for X-Pack, this may perfectly work for you. Because X-Pack Security is NOT FREE , I will go on to different solutions for achieving security. This is another solution which I have not tried still, but looks really promising. The plugin is recommended in the ElasticSearch “Security Plugins” documentation section. They also have all the blink blink features like encryption, authentication, authorization plus they have FREE TO USE version , but also paid plans. This is the solution which I have tried (and still using) and for now suites best my needs. They are also selling this product, but having community FREE TO USE version as well (the one I use). The only one thing I don’t like about search guard, is that the documentation is terrible. That’s why I will try to write deep walk-through of the installation and configuration process, hoping to make some lives easier than main.. Here I assume you already have working ElasticSearch cluster. In the examples that follow, I’m using ES cluster consisting of 2 nodes (both being data and master eligible nodes). Also the nodes are using ElasticSearch version 6.5.1 . So let’s generate the certificates by using Search-Guard provided tools, which is really easy to do. # If you want to create a new certificate authority, you must specify its parameters here. # The distinguished name of this CA. You must specify a distinguished name. # the root certificate will be used for signing. # of the certificates. This can be a list of DNs, which can contain wildcards. # enclosing the DN in //. # the DNs of the nodes specified in the nodes section. The next step is to upload the certificates each node will need to the appropriate cluster nodes. Fix permissions for the newly uploaded certificate files, here I assume your ElasticSearch is installed in the default (for Centos) directory (/etc/elasticsearch) and also that your local user is named “elasticsearch”. Now we are ready to proceed with installing search-guard plugin for ElasticSearch and configure it futher. We are going to first configure Node1 , from where we will re-enable cluster shard allocation and then initialize search-guard index, which is needed for storing search-guard roles/permissions and other related data. At this point ElasticSearch is still stopped on both nodes ! Open the config and add the following to the end of the configuration file. If your ElasticSearch comes with X-Pack integrated (default for Centos6/7 elasticsearch.rpm install) , make sure to DISABLE X-PACK SECURITY ! If your cluster is publicly accessible, you may want to first change the default passwords for the users or maybe comment out some of the pre-defined users as well. Here is how to change the default admin password, before starting Elastic and importing Search-Guard index. This is everything you should do ,later after initializing the SG index, your passwords will be changed. searchguard index already exists, so we do not need to create one. At this point, your search-guard plugin is initially configured ! From now on, you should always use “https://” when communicating with the HTTP channel and also, you will need to provide basic auth user and password, to communicate with the cluster . I assume you have already uploaded node2* + root-ca.pem certificates on Node2 (inside /etc/elasticsearch/ssl). The only thing left is to add configuration to elasticsearch.yml and start ElasticSearch. After enabling search-guard, all your existing clients connecting through plain connection to ElasticSearch, would be unable to connect anymore. You will need to either create separate users/user roles/ or use existing ones and configure your clients apropriate. Also keep in mind, that if you are using X-Pack->Monitoring (which is free) , it won’t work unless you install Kibana search-guard plugin (at least it didn’t worked for me before that – I was getting constant redirects). 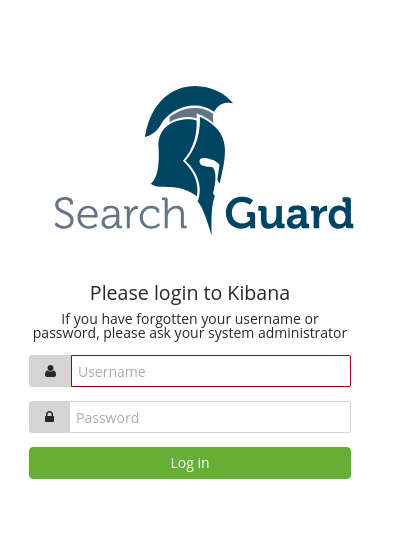 The first thing to do is to download the correct version of search-guard plugin for Kibana. I’m going to download and install the plugin on Node1 which in the current scenario would be used for hosting Kibana as well. # Disable xpack.security plugin xpack.security.enabled: false elasticsearch.url: "https://node1.gryzli.info:9200" elasticsearch.ssl.verificationMode: none elasticsearch.username: "kibanaserver" elasticsearch.password: "kibanaserver"
For login you should use the default admin credentials (user: admin , pass: admin). If you already using Logstash, you should add some additional configuration to it in order to be able to communicate with the Elastic cluster after installing Search-Guard. The steps you should take are as follows. This was my first intention at the beginning I started to search for authentication/authorization plugins for ElasticSearch. Understanding how roles_mappings and roles work in SG could be difficult, so I’m going to explain it here. # Generating hash for password "my_password"
Here I’m using the Hash generated in the previous step. As you may recall, here the role name is written as “write_only” instead of “sg_write_only”. That is how search-guard works (“sg_” is stripped from role names, when referring). The role name should be prefixed with “sg_” , which is stripped during referring the role from another files (don’t know why this is like that). Here again, “sg_” is stripped when referring backend role. "reason": "no permissions for [indices:data/read/search] and User [name=writeonly, roles=[write_only], requestedTenant=null]"
The request has failed – as expected.